Over the last decade many of the principals of molecular gastronomy have carried over to mixology, but generally speaking you have to take out a second mortgage if you want to try them. Here's a kit that lets you be a cocktail chemist in the comfort of your home. No mortgage required. It's Friday afternoon, you've made it through the long week, and it's time for Happy Hour, Gizmodo's weekly booze column. A cocktail shaker full of innovation, science, and alcohol. E=MC2drunkforthisrightnow. 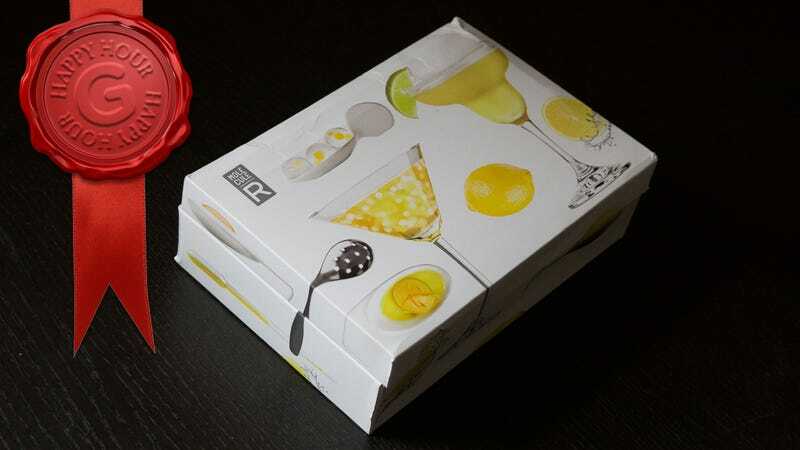 The Margarita R-EVOLUTION is a kit that contains basically everything you need to make three different molecular margarita recipes, aside from the fresh ingredients and the booze itself. There are also R-EVOLUTION kits for mojitos and cosmopolitans and a lot of food, but we only tried the margarita version. Science-curious drinkers. People who've wanted to experiment with molecular mixology but didn't know where to start. People who miss their childhood chemistry sets and want to drink to forget. You'll also need a blender (ideally a hand blender), and items like mixing bowls, measuring cups, and so forth. We started with the recipe for "Azure Bursting Pearls." The process involves blending blue curaçao, water, and sugar with sodium alginate. Then in a separate bowl you dissolve some calcium lactate in warm water. You use the included pipette (think jumbo eye-dropper) to drip the blue solution into the clear one. As the droplet hits the other solution a thin, gelatinous membrane forms around the outside, though the inside remains liquid (for a while). This gives it a blue "caviar" look. You then make a margarita as you normally would and stir the blue pearls into it. There's also recipes for Margarita Spherification (which actually uses a technique known as reverse spherification) for making a larger sphere that will "explode in your mouth." You bathe the mango/cointreau spheres in coconut milk, tequila, and lime-juice and eat them out of a soup spoon or tiny bowl. Lastly there's a recipe for a margarita with citrus foam. For that one you make a tart foam using soy lecithin to stabilize it. If you are (or were ever) into doing science experiments, this is super fun. Watching the liquid turn into clear pearls is just really cool. The recipes in the book aren't great. The flavors are just a little off. The blue caviar, for instance, has virtually no flavor, even when you chew them. The Margarita Spherification recipe is definitely better, but it's still a little odd. You can, and should, tweak them to make them better. As is, the Azure Bursting Pearls recipe relies too heavily on the sweetness of the pearls, which don't really come through. Instead you should make the margarita as you normally would so it's not reliant on the pearls. Or see if you can pull off the same recipe with more curaçao and less water, or add a little citric acid to the mix to give it some tartness, perhaps. The Margarita Spherification recipe looks like an egg. The Citrous Foam actually adds a lot of flavor. From a taste perspective, this is easily the most successful of the three recipes. I'd definitely consider adding it to future at-home margaritas, though it is a bit messy to make. The other two recipes (that use sphereification) take a fair amount of time and prep. At the same time, you can't really make them very far in advance because the blue pearls will toughen and the marg spheres are likely to break. That makes this less awesome for parties, but definitely something you can do when entertaining a small but patient group. While the instruction booklet is generally really clear, straightforward, and thorough (it even has a FAQ for each recipe), there are little bits of info accidentally omitted. How long are you supposed to leave the margarita spheres in the freezer? How many blue caviar pearls are you supposed to add to the drink? Who knows. There are a lot of ways to mess things up. The big spheres, for instance, are very delicate, and will rupture easily if you're not super careful when you pick them up. While there's only enough to make each recipe twice (though each time you make it, it should serve two to four people), the key ingredients—calcium lactate, sodium alginate, and soy lecithin—are all easily replaceable. They're also "natural" ingredients. As in you're not going to poison yourself. You have to be very careful when using the sodium alginate to keep it from clumping and/or sticking to your hand blender. It gels quickly. The blue pearls sink. Use a margarita glass if possible. If you have a tall glass, it'll look kinda dumb. See below. Be careful when disposing of the leftovers. Pour everything into the sink and you're going to have a strange, blue, gelatinous clog on your hands. Damnit. I added a little food coloring to the watered down blue curaçao mixture to improve the color. Before you start freaking out, how do you think curaçao got blue in the first place? Heartbreak? If you're interested in molecular mixology or gastronomy, then yes, sure. It's only $30 bucks and at the very least it's a fun way to spend an afternoon or two. The drinks it produces aren't the most delicious cocktails you'll ever taste, but that's something you can refine along the way. Don't get caught up in the whole "Is it or isn't it a gimmick?" debate (it's a gimmick). If you're going to enjoy yourself while doing it, then who cares?